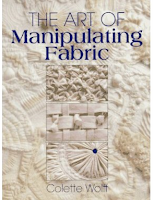 If you are a creator of crafty and creative things, specifically those of the sewing machine world, you owe it to yourself to get this book by Colette Wolff: The Art of Manipulating Fabric. This is the most comprehensive and complete resource for changing your flat one-dimension fabric into an amazing piece of art (or just a garment). Even for those who don't sew, machine or by hand, this is great inspiration for creating.